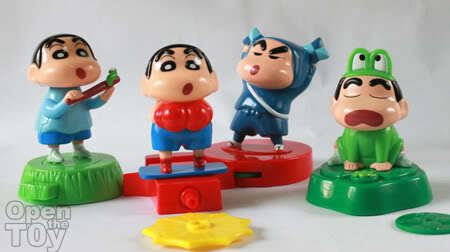 Crayon Shinchan was one of the Manga comic I started to read in the mid 90s. 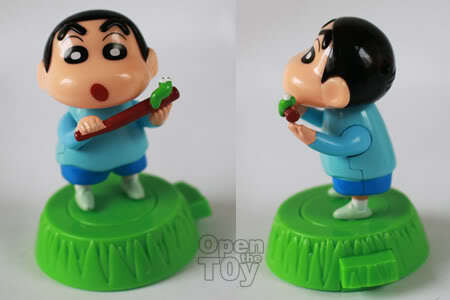 Not too long ago, the maker and the artist of Crayon Shinchan passed away when he went for a hike. So these figures could consider a tribute to the maker? 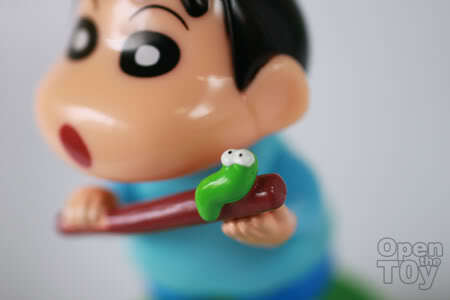 What is Shinchan doing with a Caterpillar? I guess this scene should be a part in the comic.This is the only original looking Shinchan in the series as we will see him doing other cosplay later. 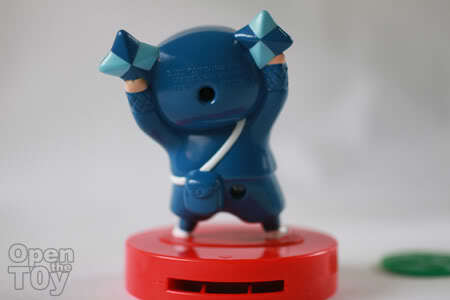 The fun for this toy is a twisting action when you press on the side button. During the rotation, the head and the part of the body will shake like he is his wiggle dance. A close up to the caterpillar. Shinchan in his boxer cosplay. Don't you dare look down on him. Armed with his boxing gloves, he is one feisty fighter. 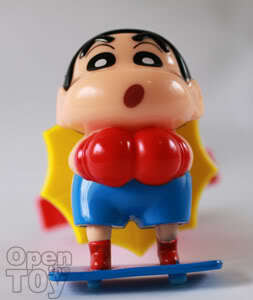 Shinchan can be placed on top of the presser for display. 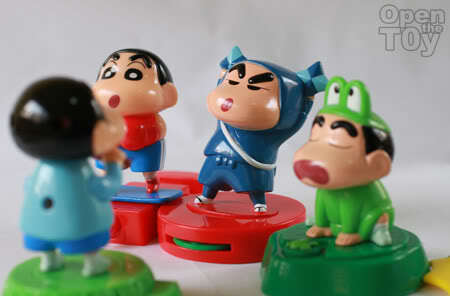 To activate the boxing action, insert the plastic presser to the back of shinchan and press the surge-looking thingy. 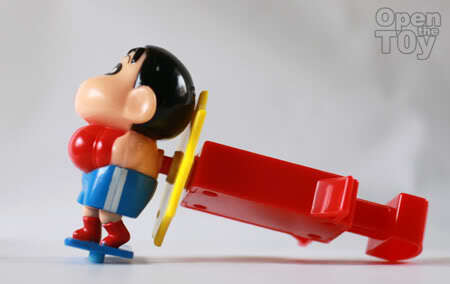 It would be more fun if the other player have the same Shinchan, both can have a match as shinchan move back and forth. 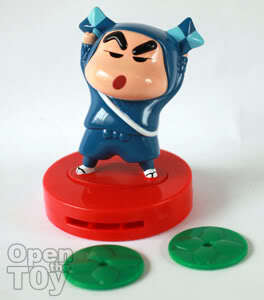 I would say in term of cosplay, the ninja Shinchan is my favorite. 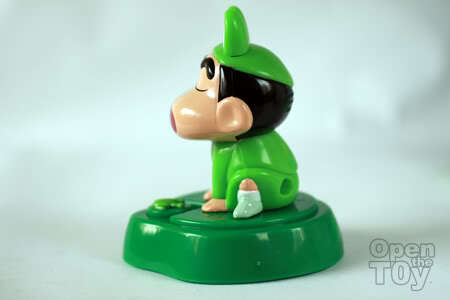 This toy allow the shooting of the disc below the character stand. All you need to do is to insert one end with the disc and insert another disc and the other end and push it inside to simulate the shooting of the shinken. 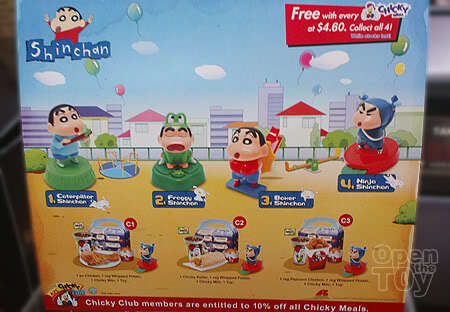 The back view of the Ninja Shinchan. Come with a pouch too! 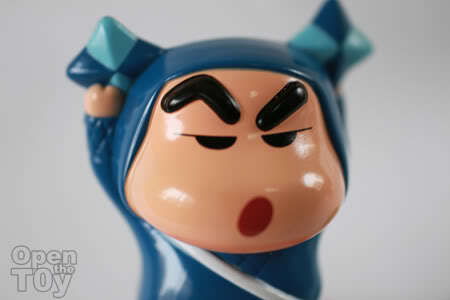 And a close up of Shinchan expression as a cold looking ninja. 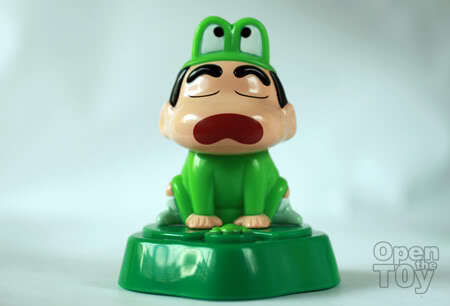 Finally one of the most funniest cosplay of Shinchan as a Frog. Why a Frog? 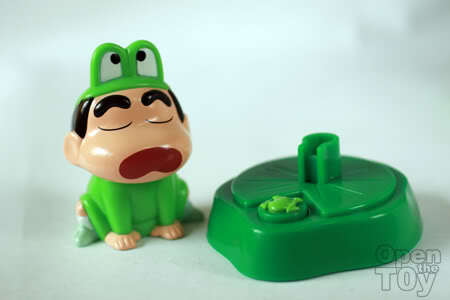 Maybe he is a fan of Keroro? I don't think so. 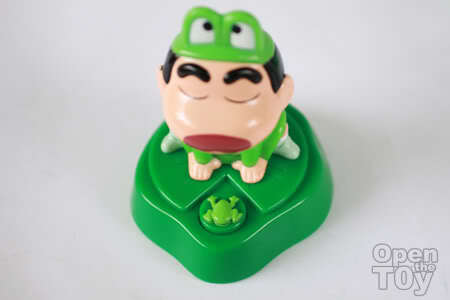 And Shinchan will jump up like a frog. 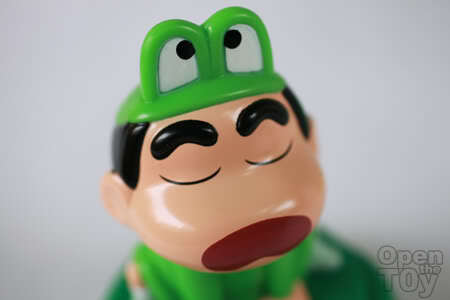 This is the only Shinchan that closed his eyes. Now placing them side by side. Shall they gather up to sing as a song? Better not. 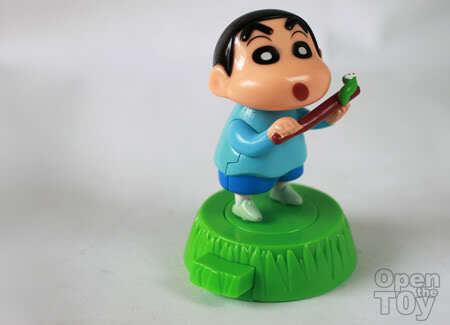 I know Shinchan can't sing. A group photo before we end? Those are soooo coool! I was a fan of this cartoon when I was a kid, so funny! Wish we had stuff like these here. Did you get these collectibles? 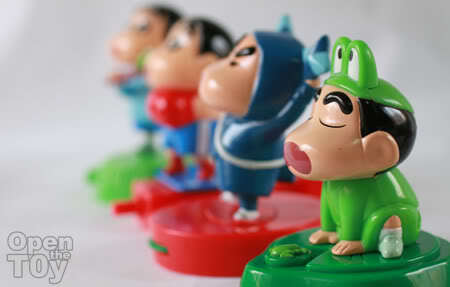 Adorable Shinchan will his signature thick eyebrowns. Didn't see his dog, 'Xiao Bai'. Ha! Ha! Face expression are quality, like the frog suit one myself. The ninja and frog Sinchan is really funny! You get them all in one go? cute, cute, too cute... i can’t stand it... =PPPP all of them rocks !!! 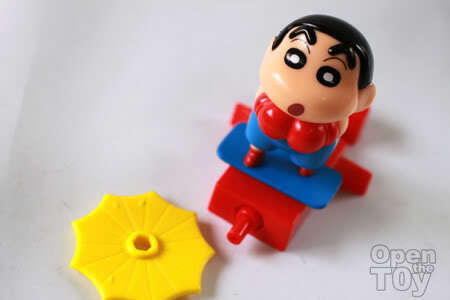 I'm a big fan of shinchan like your wife. What makes me laugh is it's wizzy dance. I've seen all animes but only read 2 tomes of the manga. 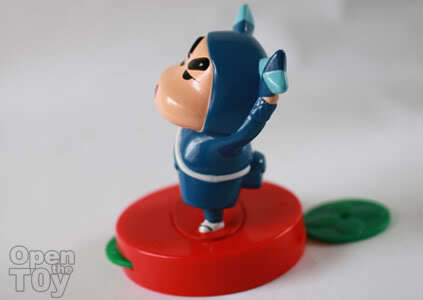 I didn't know that figures of him existed, i want hem too. They're too cute. I wished his dog is in the toy collection too but sadly it didn't. 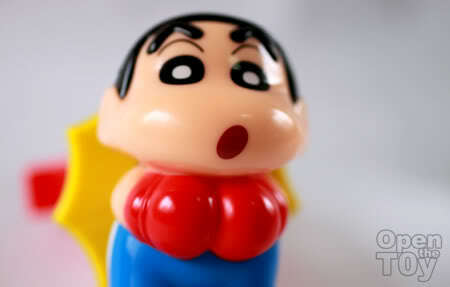 I was taken in with the quality of SHinchan's expression too! Thanks! It hard to come by such good offers.